Ted Owen, one of three current representatives of the EIR program, giving a lecture to CoB students in Fall 2015. The newly established Executive in Residence (EIR) program provides students, faculty and staff of the College of Business an opportunity to network with the college’s alumni who are successful in the business world. These alumni visit the university to share experiences and lessons they have learned that have benefited their careers. While on campus, the graduates give lectures in different classes, either recounting their success stories or tailoring their messages to the topics of the classes; attend breakfasts and luncheons, where they interact with faculty and staff; and conduct mock interviews organized by the Business Placement Center. 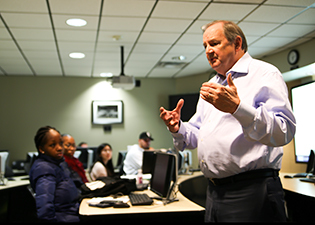 The participants of the EIR program are highly distinguished executives representing different areas of the business world, including accounting, finance, management and marketing, and are selected and appointed by the dean of the College of Business. The main goals of the program are to help the students to gain insights into their future professions and to create networking opportunities for them. Through the program, students get a chance to learn the perspectives of professionals who have expertise in various business careers. Ken Hannah, CFO of Caleres (formerly Brown Shoe Co.). Reina Mejia, CCO of Citibank in Honduras. John Renfro, chief of human resources at Capital Group. Richard Barrett, managing director of investments at The Barrett Group of Wells Fargo Advisors. Diane Schumacher, former senior vice president and general counsel of Cooper. The aim of the program is for the students to find inspiration and motivation to continue to do well in school, and to be active in out-of-class activities. By connecting with these successful professionals, the students get a better understanding of the steps they need to take to get to their desired positions, as well as of the challenges they are likely to face along the way. The EIR program gives students the opportunity to learn about a variety of companies and careers available in business, and it helps them get firsthand advice on how to develop a career path. For more information about the EIR program at the College of Business, as well as the program participants, you may contact Jessica Samples at samplesjm@business.siu.edu.